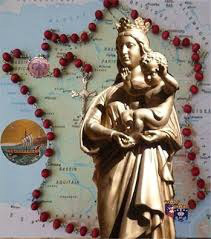 “9o - I will transform the stones of the shrine of the Cross (La Fraudais). "I will turn them into dwellings; and my servants will inhabit around the blessed walls which My Angels are going to put up for Me. "They will keep watch on the walls of My sanctuary and preserve it. That little hamlet of houses amidst gently rolling land, that place where the shrine is, will be built up again by the Angels. These souls will “inhabit around the blessed walls” which have been put up by the Angels. They will receive the pilgrims who arrive at the shrine, befriending them as the Angels always do, by joining “their voices to the Angels’ concerts, to the prayers of pious souls, and also of sinners”. Theirs will be the glory of the celibate life of a religious. They will be the mothers and fathers of souls for, by their selfless lives, they will help to heal wounded souls and bring dead souls to life.